This year is shaping up to be a defining year for the future of development in and around the North Fulton area. In 2014, we saw the trend toward walkable development take a root with Avalon and Alpharetta City Center leading the way. Smaller projects sprinkled around downtown Alpharetta, Roswell and Milton Crabapple are helping to create authentic places where people want to be. Many of these will be wrapping up in 2015 and there are a number of additional projects, big and small, that we will learn more about. We will definitely hear more about Avalon’s phase II. Judging by the crowds on the ice skating rink this holiday season, Mark Toro has hit a home run with the first phase and the development is only about a third complete. There’s still a lot more coming on the west and east ends of the development. The Monte Hewitt homes that will be going up will rival upscale developments on 30A, like Rosemary Beach, in design quality while the expansion of the retail and office on the east end will continue to expand Avalon into an attractive destination for dining and shopping. Expect to see plans for a full service hotel and a convention center in phase II and Mr. Toro couldn’t be pushing harder for a MARTA train station at Avalon (AJC Op-ed Link Scroll Down). Add in the Gwinnett Tech campus underway across Old Milton and things are really looking bright for Avalon. You might think Avalon is enough for one city but in Alpharetta, things are really cooking. The city just opened its new City Hall building in December as the first big piece of the Alpharetta City Center project which will bring a new Fulton County library, parking deck, park and mixed use development to the heart of Alpharetta. There are a number of peripheral developments and business openings that are helping downtown Alpharetta evolve into a truly walkable and vibrant neighborhood. With both of these projects in full swing, Alpharetta is hot. There’s even word of a planning effort that will work to design a walkable and bikeable corridor of development between Avalon and downtown Alpharetta. Not to be upstaged, Roswell is looking to get into the big mixed-use game as well. The proposed Riverwalk Village would rival Avalon in size with just over 100 acres on the south east section of the Holcomb Bridge / GA400 interchange. The price tag is estimated to be in the $500 million range and the proposal includes over 1,500 residences, 1.7 million square feet of office and 500,000 square feet of retail. Over 40 percent of the land would be preserved as some form of green space. It will center on a small lake which will be the heart of the development with a 200 room hotel, Roswell’s largest, overlooking the lake. The opportunity to connect this development to the Chattahoochee by trails is an incredible differentiator and unique in the region. There will be much more information coming on Riverwalk Village in 2015 and if all things go as planned, ground could be broken before the end of the year. Whenever large developments come up, traffic is always the number one concern (we do live in suburbia after all). So, any discussion should also include what is being done doing to accommodate cars. First and foremost, the answer to congestion is not more lanes. Widening HBR or 400 or Old Milton will not resolve issues in the long run. Widening roads can help in the short term but two better alternatives are distribution and options. Distribution involves creating more connectivity while options give people different ways to accomplish what they are looking to do. Roswell and GDOT are currently working on some targeted projects at HBR and 400 to help remove some congestion points. These are helpful but will do nothing to reduce the overall number of cars using that interchange each day. The city is working on a long term, $50 million+, project to build the Big Creek Greenway which will connect Old Alabama and Warsaw and provide a much needed alternate route over 400. Other big long-term transportation projects include widening Old Milton and the Roswell Historic Gateway which will remove the reversible lanes on South Atlanta Street. There will likely be some progress on each of these but don’t expect to see any real progress for years. The other long-term project that will get a little clearer in 2015 is the proposed Red Line extension of MARTA Rail. Under new leadership, MARTA has had quite a turn around over the past 2 years. They are expanding to Clayton County, the first new county to join MARTA since its inception and they are looking at three potential rail extensions; the Clifton Corridor, North Fulton and Clayton County. These are obviously long-term, billion dollar+ projects but they are worth keeping an eye on. The Red Line extension would add 5 or more stops all the way up to Windward Parkway giving a much needed option to drivers who sit in the soul crushing congestion on 400 each day. They are also, implementing a number of initiatives to turn empty spaces and parking lots around stations into Transit Oriented Development. Amanda Rhein is heading up that effort for the agency and was named one of the 20 people to watch in 2015 by CreativeLoafing. Other interesting local and regional projects to watch in 2015 are; Golf Carts in Roswell, the Roswell City Walk Apartments, Grove Way redevelopment in Roswell, Riverwalk Trail extension to Willeo, the bike/ped bridge over the Chattahoochee, Canton St & Woodstock Redevelopment, Sun Valley Extension, GA400/I-285 Interchange, Path 400 in Buckhead, the Beltline Westside and Eastside Trail extensions, Ponce City Market, Atlanta Waterworks Park, Bellwood Quarry Park, the Braves and Falcons stadiums (new & old) and perhaps the biggest redevelopment out there, the Doraville GM Plant redevelopment. As you can see, the future is bright for walkable and mixed-use development in North Fulton and the Atlanta area. Get out for a walk, there are more options than ever before in our Region. In November, news broke on a huge real estate development slated for 104 acres of the southeast quadrant of Holcomb Bridge Rd and GA 400 interchange. It’s the biggest news out of Roswell in years. It could be the biggest news out of Roswell since the last development was proposed in virtually the same area. Many readers will recall the failed $2 billion Roswell East (aka Charlie Brown) proposal in 2007 that succumbed to significant neighborhood backlash before it had the opportunity to succumb to the real estate downturn. the new project, Riverwalk Village, is still very ambitious. What $500 million project isn’t? There is simply too much to cover in one column but here’s the quick & dirty (and my previous columns here & here). It’s much smaller than Charlie Brown but it’s still huge. It could have up to 1,556 residences with some multifamily (renter and owner occupied), senior housing and single-family attached homes. Office space could total 1.7 million square feet, a tad more than the BoA building in Midtown. That’s on top of almost 500k square feet of retail and a 200 room full-service hotel. The Swift School could open a new campus and about 43 percent of the overall site is reserved for green space and walking trails that would connect to the river and nearby neighborhoods. This project is quite simply a mixed-use behemoth. Under the current proposal, the buildings will be low to mid-rise with the tallest proposed buildings being 10 stories. Most of those taller buildings will be down the hill using the topography to create the illusion that the buildings aren’t as tall. The hotel would be 28 rooms larger than the Doubletree, currently Roswell’s largest. The project is being led by Duke Land Group of Dunwoody. They are seeking rezoning from the city and have presented a site plan that they believe works within the new UDC to provide the type of development that the city sees as contextually appropriate for that part of the city. Asking around, this group seems to be well heeled and very capable of executing on the vision. The official announcement came roughly one week after the opening of Avalon another nearby mixed-use mega-project at Old Milton and GA 400 in Alpharetta. This seemed very timely and no doubt was meant to capitalize on the excitement surrounding the opening of a high profile walkable mixed-use development. The comparisons are bound to continue but Riverwalk Village will be strikingly different than what you find at Avalon. First and foremost, Riverwalk has the Chattahoochee. The only river that Avalon has next to it is the river of cars running up and down GA400. Riverwalk is mixed-use and it’s roughly the same size parcel but Duke will be going for more of a village or neighborhood feel than an upscale shopping destination. The current site plan calls for 16 different sections broken out into 7 categories, each with a slightly different intent and purpose. For the most part, I think Duke has hit the nail on the head. 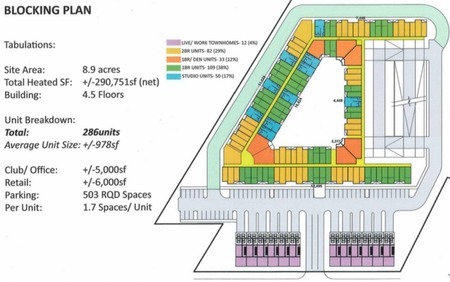 A1-A2 - Office District - Well located along the western edge placing it closest to 400 keeping the residential and retail further away from the highway. B1 - Medium Density Residential (Townhomes) - I really like that this parcel is situated close to the river and will offer some of the best walkability options for residents who will be able to walk to shops, restaurants, office and a national park (and eventually a train station?). C1-C8 - Mixed Use Development District (Residential & Non-Residential Uses, Such as Retail, Restaurant, Civic, Office, Multi-Family, Entertainment) - This one is a bit tough to envision but the obvious main point is that it will front what appears to be a Main Street that bisects the new development. This could create a great walkable street on the east side of Roswell where nothing close to a walkable urban street currently exists. The small bridge crossing the lake should be a great focal point. D1 - School or Alternate Residential District - Well played. This part of the property abuts 21 single family homes in Martins Landing, the most vocal opponent of Roswell East. So, they make some options. E1-E2 - Entertainment District (Restaurant, Retail, Grocery, Multi-Family) - Everyone loves entertainment. From the initial renderings, they seem to have done an excellent job putting this area next to the lake, using the water in an urban fashion actually building right up to the water. Be prepared to be Entertained! F1 - Hotel District (Hotel, Civic, Multi-Family) - Positioned directly on the little lake. Well thought out and Roswell needs this. Period! Greenspace - (Parks, Trails, Landscaping) - A real opportunity to differentiate the development from virtually any other in Atlanta. Mixed-Use with a connection to the Chattahoochee River and the Roswell Riverside Trail and potential MARTA connectivity. This project will increase a lot of things not the least of which are the tax rolls and traffic. The first is obviously a win for the city while the second is going to make what is already a bad situation a bit worse. There’s no sugar coating that. The city and state need to step up and fix the HBR/400 interchange. There are some small projects underway but much more is needed. It sure would be nice to have the $48 million in improvements from TSPLOST but that’s spilt milk. Proposal for HBR/400 Interchange Circa 2012Current projects like the early off ramp from 400N, the extended northbound turn lane to 400N from Old Alabama and the realignment of HBR eastbound to eliminate the lane switching before Old Alabama will all help but more is needed. Mr. Acenbrak has some tricks in his bag I’m sure but we’re going to need money to make them happen. Now that I’ve given you most of the facts, it’s time to share some of my thoughts. If the developer is truly going for a village feel, architecture and street design are critical. Modern corporate architecture does not jive with a village feel. Don’t try to be Avalon. Take inspiration from some of the award winning developments from metro Atlanta such as Serenbe, Vickery Village and Glenwood Park and incorporate the designs seen in our historic district that make Roswell great. Roads should be as NARROW as humanly possible and connect as much as possible. Villages and wide roads don’t mix. Villages and fine grained connectivity do. Also, let's finally connect the greenway to the river. Figure out the MARTA solution now rather than later. Everyone will be better off for it. I’ve heard an underground solution might be necessary due to the incline from the river. How cool would that be to enter Roswell by subway and walk to the River? Old Alabama Avenue - OA should be turned into a grand tree lined avenue in the European style from HBR all the way to the river. DPZ gave us a fantastic model in their Historic Gateway Master Plan. Gigabit. It’s a must. Avalon has set the standard. If we are serious about attracting business and entrepreneurs, we must have the fast speeds that they require. Wishing Duke all the best. If all goes well with permitting and approvals, ground could be broken in Q4 2015. One thing is for certain.. a lot will change between now and the finished product. Look forward to more coverage of Riverwalk Village by The CurrentHub and check my blogwww.NewUrbanRoswell.com for my thoughts and opinions. I often write about what makes great places. I try to provide insights on what makes places great and what makes places not so great. It generally boils down to this.. Places built around people that are highly walkable tend to be great. Places built around cars, not so much. Places that try to accommodate both are hit or miss but usually fall into the miss bucket. Now, I know a lot of this is personal preference but just take a look at look at home values and vacation destinations to discover the magic of place. In a 2009 study on walkability, Walking the Walk, houses with above average walkability were seen to command premiums of about $4,000 to $34,000 over houses with just average levels of walkability in the typical metropolitan areas studied. Additionally, the study saw between a $500 and $3,000 increase in home values for each point increase in Walk Score. In our own metro area, the same place/walkability premiums exist and can be evidenced in neighborhoods such as Virginia Highlands, Inman Park, Decatur, Historic Roswell and eventually Avalon. Vacations, another high ticket item where place seems to matter, also show a distinct preference for destinations that deliver great experiences . Vacation destinations are almost always either walkable urban environments or places that bring us closer to nature, and it is apparent that the ‘burbs just don’t provide either very well. Unless you’re visiting a friend or family, you probably aren’t headed to suburbia for vacation. There just isn’t any ‘there’ there. People crave places with personality and will pay a premium for it. Building better places was an important discussion 5 or 6 years ago when we were in the throws of the Great Recession but it’s even more important now as we are seeing a building recovery, dare I say boom, in North Fulton. The unfortunate thing is that we are still building the same crap devoid of personality and lacking any true future. Will Windward be the next historic district in Alpharetta? Why are we still throwing up commoditized subdivisions dominated by front loader garages that pretend to be walkable but yet connect to nothing? Why do we still tolerate sucky architecture from builders looking to make a quick buck? In my opinion, the problem revolves around our obsession with economic efficiency and our love affair with the short term. When we add on to our suburban street network, we fail to see how that will impact our commute in 5 years when more vacant or under developed land is developed. We purchase a home using borrowed money planning to sell it within 5-10 years hoping for a quick profit. We think that a quality interior will somehow fix the shallow and cheap exterior. We are blinded by the mortgage interest credit. What a sad sad place we have created when our homes and neighborhoods are a punchline for a witty couple who recognizes the hilarity of our suburbs. Like it or not, we are married to the places we build. Like a spouse, don’t expect to change places. Once built, we have to accept them for what they are. When the traffic gets bad, realize that you married that traffic when you chose to live in a car oriented world. When you have to drive the kids everywhere, don’t think you’re going to change that zoning code so things can be closer together. When you want to ride your bike, go ahead and strap it on the SUV and drive it over to the greenway because you’re married to a place where riding on the streets is akin to risking your life. But, maybe you’d be better off.. or maybe you just need to get a divorce and move to a real place that will truly truly stand the test of time. One that is capable of growing with you as your needs and preferences change. For those of us who can’t get a divorce from our places, we need to focus on building more real places and quit pretending that the suburbs as we know them are the answer. Over 90% of the Atlanta region lives what is loosely called the suburbs. So, if the overwhelming majority of people live in suburbia, it must be the right choice, right? Well, I wouldn’t call Suburbia the pragmatic choice. Suburbia stretches resources and eats up land in ways that can’t be sustained in the long run. Currently we are seeing suburbs attempting to become more walkable and significant development being focused on rebuilding our urban cores. However, if you’ve looked around recently, there is a lot of suburban style development going up around the northern burbs. That’s great economically in the near term but it might not be so good in the long term. It brings more residents, it requires new infrastructure, it creates the need for all things that cities must provide. These things cost money and often turn into long term liabilities for cities and municipalities. The organization StrongTowns has been illustrating the high costs of sprawl to cities across the country in an alarmingly effective way. Their Curbside Chat is a bit like taking Morpheus’ red pill in the Matrix. Their premise goes like this.. Our ability to grow by taking on more debt is waning. Federal and State incentives for growth will become more scarce. The tax productivity of auto-dependent places is lower on a per acre basis than the pre-WWII city design. Cities need to stop pursuing the short term prosperity that will result in long term liability. They refer to the post WWII development pattern as the Suburban Experiment and compare it to a Ponzi scheme. The suburban development pattern requires new growth to pay for long term liabilities. Eventually, the growth stops and maintenance comes due. They argue very effectively that the most financially viable development pattern for cities is one that resembles the way we designed cities prior to WWII, prior to the suburban development pattern. If they are right, and our economic growth is stunted by sprawl, then why aren’t we doing anything about it? If we admit they are right, then we are saying we have been wrong for all of these decades. We are saying that we sunk our national wealth into a development pattern that caused us to go broke. It married us to our cars and our commutes and it drained our municipalities of cash to build and maintain roads that don't generate enough in property tax to maintain themselves and it unfairly burdened future generations with debt that was ultimately wasted. It’s hard to admit when you made a wrong turn... And that’s why we aren’t making wholesale changes to our development pattern. So, if we are too proud to admit we mad a bad financial bet on an inefficient development pattern, will we do anything to protect the environment? The suburban lifestyle seeks to create refuge in the environment but in it’s effort to create an idyllic home in the woods, it is actually wrecking the very woods that it seeks to be so close to. According to a joint study released in July by the US Geological Survey and NC State University, sprawl in the southeast will increase by 110 to 180 percent between now and 2060. The piedmont region between Raleigh and Atlanta will experience the largest growth. By 2060, we could see a virtually uninterrupted stretch of development on that corridor. This will have huge environmental impacts in a region that has some of the most biodiversity in the US. I don’t know about you but I think developing generic suburban style development from here to Raleigh, is a travesty. 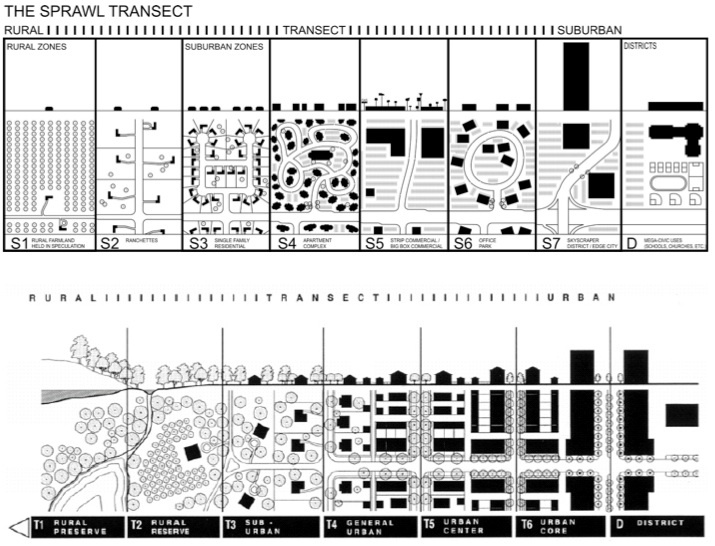 If we continue that direction our places could look like the suburban transect that planner Dan Zack designed to effectively illustrate the difference between Suburbia and the type of development that new urbanists advocate for. In Suburbia, we divide uses and limit connectivity, while New Urbanist developments combine uses and encourage connectivity. Juxtaposed, next to each other, it’s easy to see the difference. If we want to build more productive places, that reduce environmental and economic waste, we need to be aggressively building mixed-use, walkable places that follow the pre-WWII development pattern. The New Urbanists have been doing this for over 30 years. It’s time to get serious about it. I recently had the opportunity to attend CNU22 the annual conference for the Congress for the New Urbanism. This year it was in Buffalo, NY. The most common question when I told my friends that my geeky passion was taking me to Buffalo was something like ‘why Buffalo?’ Well, it has great bones and lots of warts. It’s exactly the kind of fixer-upper New Urbanists love. At the beginning of the 1900’s, Buffalo was home to more millionaires per capita than any other city in the country. Population peaked at around 580k in 1950 and has fallen by roughly 55% since as the industries that made it one of the richest cities in America died or moved away. At this point, you may be wondering what Buffalo has to do with Roswell and North Fulton. Well, it all comes back to a tour that I took while I was there. 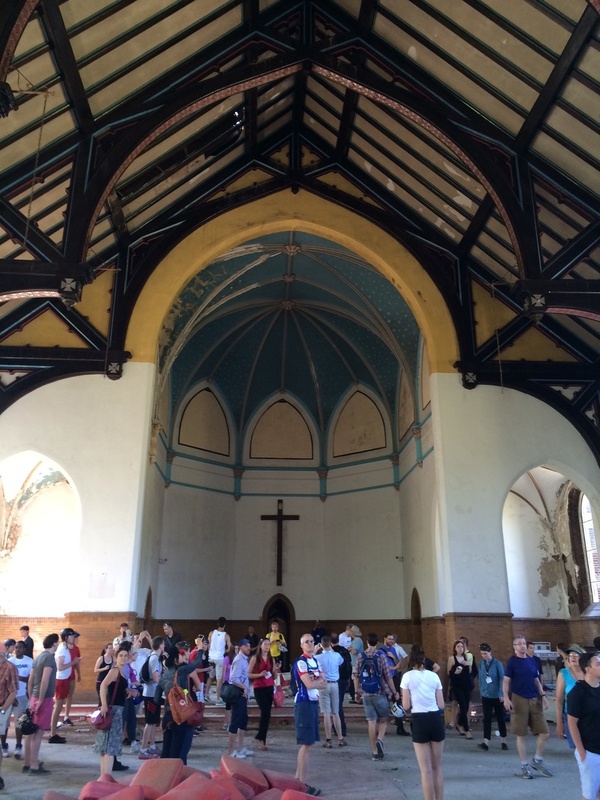 Our second stop was at the Sacred Heart Cathedral on Emslie St. The controversially named Tour de Neglect took about 75 wonky planners, architects and urbanism enthusiasts through the economically devastated East Side neighborhood to showcase what happens when once vibrant places become slums. At one point, East Side was a thriving neighborhood with one of the largest Polish and German populations in the nation. Since the 1950’s the combination of economic stagnation and white flight have reduced the population of what is Buffalo’s largest neighborhood geographically by almost 90% and the racial makeup has gone from almost 100% white to almost 100% African-American. To say that 75 mostly white, relatively well-off out-of-towners riding bicycles through this neighborhood was awkward puts it lightly. Thankfully, we had well connected and well known guides. This is the type of place that people reading the CurrentHub would rarely end up. If they did, it’s likely the result of a wrong turn or a volunteer project. But, it made me wonder if the northern burbs of Atlanta face a similar fate? When looking at East Side, I see a neighborhood that actually could eventually recover. It has good bones and great places and it’s easy to bike and walk. However, The way Atlanta has built its suburbs around the car makes me less optimistic. According to AAA, the annual cost of owning a single car is just over $9,000. Even reducing that by driving a cheaper car, our poor, who are being forced to drive by our dispersed landscape, are being hit with a huge financial burden as a percentage of their income. If you can’t afford a car, good luck because you’re not going to be near a frequent bus route and you’re definitely not going to be able to walk or bike to work! Poverty is like a vicious cycle and a suburban landscape exasperates it. Just the act of being poor creates the conditions that make it difficult to recover. A 2013 Journal of Science article concluded that poverty imposes such a massive cognitive load on the poor that they have little bandwidth left over to do many of the things that might lift them out of poverty. It also estimated that the condition of poverty imposes a mental burden equivalent to a 13 point IQ drop. Just like people and families, once a neighborhood starts down the path, it is hard to recover. You can see this in small pockets all over our suburban landscape. Subdivisions that were the nice places 30 or 40 years ago haven’t aged well. They become more costly to maintain and many end up falling into disrepair. We’re lucky to live in a beautiful place but Buffalo is proof that it may not always be that way. As cities continue to become more popular places, gentrification will drive the poor somewhere.. and that somewhere in metro Atlanta is where 85% of the ‘affordable’ housing is. Aging and dying subdivisions will become the slums of the 21st century. Our sprawl bombed landscape burns holes in our pockets and literally crushes those who can’t afford the amenities that motordom requires. We need to rethink how we have built our cities and towns and make them work for everyone. Not just those of us fortunate enough (for now) to drive with no concerns. Here are some additional shots from the tour. Inside the Sacred Heart Cathedral The revitalized area of Larkin Square. This is only 5 short blocks away from the Sacred Heart Cathedral. 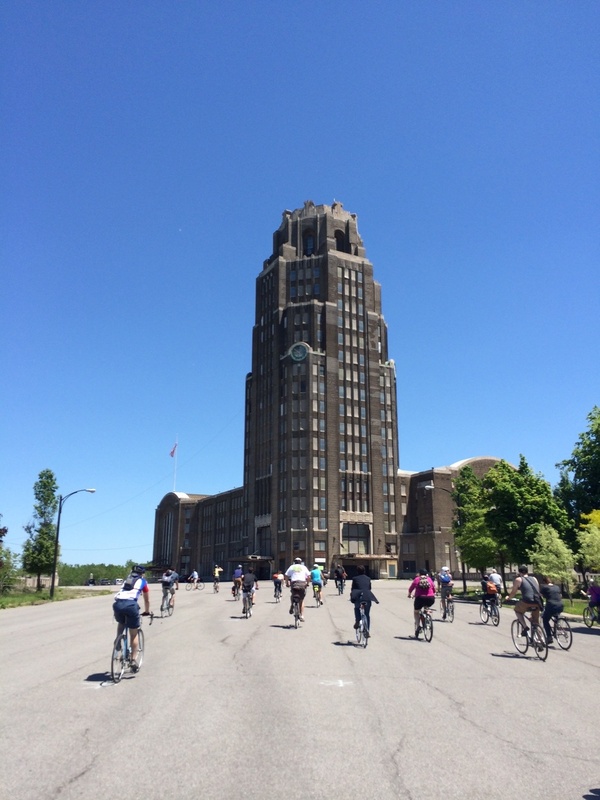 Approaching the 17 story Buffalo Central Terminal finished just before the stock market crash of 1929. It was active until 1979. The beautiful interior of the Buffalo Central Terminal. This place has incredible potential and it looks kinda like the Halls of Justice right? Most of my suggestions focused on increasing transportation options and improving safety. Interestingly, the one that got questioned was the point about dropping speeds on residential streets to 20 mph. When I indicated that my rationale was for safety reasons, one commenter insinuated that this isn’t necessary because we don’t have a pedestrian death problem in our residential areas. I agree and we should feel fortunate for that. However, I think many a homeowner can point to multiple occasions where they have encountered drivers speeding recklessly on neighborhood streets. Speed has a logarithmically negative effect on survival rates for pedestrians involved in collisions with cars. A 10% increase in vehicle speed increases pedestrian fatality risk by 40-45%. Data shows that when a pedestrian is hit by a car traveling at 20mph, they have a 95% chance of survival. However, as the speed increases, the survival rate plummets. When a car is traveling 40 mph, the pedestrian survival rate drops to just 15%. This is just plain physics. Doubling speed results in the required stopping distance quadrupling and the kinetic energy absorbed at impact is also fourfold. We may not have a death problem here in North Fulton but nationwide, more than 30,000 people are killed in car crashes annually and an increasing percentage of those are pedestrians. Ten times that number are seriously injured every year. The costs to society are staggering but we accept it as a necessary evil to support our auto-dependence. Slowing down to 20 mph is a radical idea that would increase safety in our communities for pedestrians and cyclists alike. That said, simply lowering speed limits isn’t a panacea. Drivers generally drive at the speed they feel safe regardless of the posted speed limit. This comfort zone, the speed that feels safe, can also be called the design speed or the speed at which the road was designed to be safely navigable. The philosophy of wider, safer, faster holds true here. The wider the road is, the safer it feels at higher speeds. This counterintuitively increases speeds which conversely decreases safety for everyone involved. We’ve all lived in or driven through residential subdivisions with streets wide enough to fit parked cars on each curb and two active lanes. The problem with this is that the streets in suburban residential areas are rarely every fully lined with parked cars. The end result of this is a dangerous design with wide expanses of asphalt that encourage teenagers to test their limits and rushed commuters to push the gas. This would happen in this environment regardless of whether the posted limit was 30 mph, 25 mph or 20 mph. It’s just not conducive to a slow drive. That said, a 20 is Plenty campaign such as those that are having great success across Europe and the UK would be a bold step to create safer and more walkable cities. The movement is slowly making its way to the US and is now under consideration in several cities and towns in the northeast. New York City is considering it and some people have even gone around town putting up their own signs on light posts. There is also research indicating that slower street speeds are linked to more social connections, a stronger sense of community, higher property values and increased walking and biking. Step 1 (year 1-3).. Give all neighborhoods and subdivisions the option to adopt a 20 mph limit. Step 2 (year 4).. Adopt on all roads that have residential as > 50% of their frontage and on any road that fronts a school or park for a quarter mile in each direction. Step 3 (year 1-10 and beyond).. Re-engineer streets over time to narrow lanes and install street calming devices that would encourage slower speeds. The next time you’re driving through a neighborhood remember that 20 is Plenty. Does This Subdivision Make Me Look Fat? Your significant other probably has never asked you this question but it may be one of the the most appropriate questions one to ask when pondering poundage. Way back in the mid-70s, the U.S. obesity rate was about 10%. By 2007, that rate had increased to 33% with another 33% of the U.S. being clearly overweight. In 1991, zero states had an adult obesity rate greater than 20%. Over the next 16 years, America stuffed its collective pie hole to the point where Colorado was the sole state under 20% in 2007. As a nation, we have gained 5.5 billion pounds since the 1970’s. That’s 27.5 of our largest aircraft carriers. Now, consider the tag-along maladies associated with obesity such as diabetes, heart disease, increased risk of certain cancers and osteoarthritis and we really start to see the immensity of this problem. So, is it the increased number of Big Gulps that is causing this or is it the increased amount of couch surfing? That’s a tough question to answer but studies indicate that sloth may have more of an impact on obesity rates than gluttony. A study performed in Britain looked at obesity rates between 1950 and 1990 and saw that even as gluttony peaked and declined over the years, obesity continued to climb and the data suggested a notable causal role of inactivity. A study looking at Atlanta found that an increase in daily driving of just 5 minutes increased the likelihood of obesity by 3 percent. Add another 30 minutes to your commute each way and you’re scale will start to cringe. Our car dependent lifestyle is literally driving our increased inactivity. I would wager that most of us drive by necessity not by choice. Fortunately, that is something we can start to change. The sprawl fighting organization Congress for the New Urbanism has made healthy places one of its focal points. In 2010 they partnered with the CDC make health a focal point of their annual convention, which was appropriately held in Atlanta that year. The CDC has a Healthy Places program that lays out the guidelines for building places that help improve help rather than hinder it. If you live in a subdivision where it is a challenge to incorporate walking or cycling into your daily chores, your ability to maintain a healthy lifestyle for you and your family is going to be diminished when compared to a highly walkable neighborhood. The health benefits that come from being able to open the front door to a walk friendly environment where you can walk to the store, office and park are significant. It turns out that walkable places that new urbanists and smart growth advocates strive to create are one of the best solutions to many of the health issues that our country faces. We are getting better with places like Historic Roswell, Avalon, Alpharetta City Center and Milton Crabapple providing (or soon to be providing) moderately walkable lifestyles. But there is still a lot of work to be done. Let’s keep pushing for walkable town centers with a diversity of uses, connective paths between neighborhoods as well as parks that are our kids can safely walk to and steer clear of the sloth inducing, car oriented development of the past. In 2012, world renowned planner Andres Duany came to Roswell. He and his team were hired by the city to do a master plan for Historic Roswell. His original task was to master plan the area from the river to the historic square but when he visited he was impelled to take a look at the Canton St, Hwy 9 & Magnolia intersection as well. What he envisioned was bold and has kept the city’s imagination moving ever since. In the master plan, he proposed a large square on the grounds behind City Hall that would reroute Hwy 9 around the square and closer to City Hall while creating a formal space that could be fronted by three additional civic buildings. Original DPZ concept of a traffic square.Unfortunately, the vision could not be made to work due to the high traffic volume on Hwy 9. Since then, the idea has gone through several iterations from Duany’s square to the RDOT’s giant roundabout to Lew Oliver and Alex Paulson’s conceptual master plan with a very formal classic green. The downtown development authority (DDA) felt there was something to the iterations and hired the local firm, JB+a, to draw up a plan. That plan is fully baked and is designed to complement and build upon the energy that radiates from Canton St. It calls for a beautiful tree-lined green between City Hall and Hwy 9 that will finally connect our most important civic building to the street. It also proposes a number of additional, unique amenities. First, the Faces of War Memorial will become a much more prominent feature. A final decision on where and how it will be positioned has not been made but the outcome will give it the honor and respect that it is due. Second, a beautiful, cozy open-air amphitheater will be built nestled into the trees between the green and Smith Plantation. Third, a group of three buildings including a larger mixed-use building and two smaller outparcel buildings will be built. Details of use and design for the project haven’t been finalized but suggested uses include restaurants with outdoor seating, corner coffee shop, meeting space, art studios/galleries, water feature/sprayground. There will be enhanced connectivity across the entire project that will improve walkability and make the 400 or so parking spaces at City Hall a better option for parking for anyone visiting Canton St or the new City Green. It’s not bad now and it’ll be even better with the City Green. It’s time for the city to show a commitment to the heart of Roswell and invest in the future. We have an amazing civic space that has been hidden from view for 20+ years just waiting to be unearthed. The grounds of City Hall and the Smith Plantation need an opportunity to come out of hiding and help expand the walkable center of Roswell. The time is now. City Green will create an excellent civic and cultural asset. It will enhance walkability and it will deliver the much needed active and flexible civic space that is essential to the continued revitalization of our town center. The plan calls for three phases with an estimated total cost of around $12 million with a little less than half of that coming from the city as there are grants and private dollars that will be in play. The projected return in private development from this project is enormous. 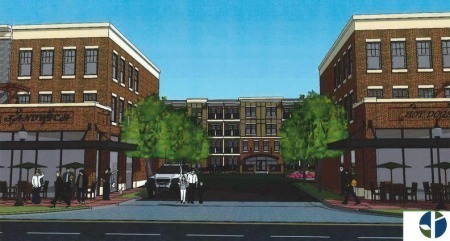 The DDA estimates that this project will entice over $200 million in private development in and around our town center. The Return on Investment alone is a no-brainer! These investments work and there are many case studies to follow; Downtown Woodstock, Glenwood Park, Historic Norcross, Downtown Greenville... A little civic courage can go a long way. There is some urgency as there are already three walkable town centers currently in some stage of development in our neighboring cities of Sandy Springs and Alpharetta. The new era of walkable, people focused development is upon us and it's time for the city to take a step and commit to building our own walkable village here in Roswell.